In one old Russian University there was a special toilet for rector. When this essential establishment appeared – hard to say. Unlikely under the czars, most possible during the communist era. If they would have done the door right from the rectorate, outsiders would do nothing to guess, but entrance to this high toilet was made from the common corridor. The rector and his secretary – girl Friday – had keys. Then some of the provosts received. Then – respected professors. No, not all, of course, but the most honored. Funny, of course, to imagine the procedure of key delivery. Whether rector himself did it after some important meeting – and I ask you to stay – or the secretary, piquantly smiling, held out in the waiting room this key symbol of recognition. Any queue never arose at this absolutely not indicated door because the public institutions of this profile in the university there were quite enough, their condition was quite decent, and the inevitable wall inscriptions in the booths sometimes simply amazed by the real academic brilliance. So there was no sense for elite to trudge specially into the rector compartment. And the devoted largely confined by pleasant consciousness of belonging to the Great Order of Honor Institution. Do not laugh, please – I was told about this by a very serious professor of that venerable university. 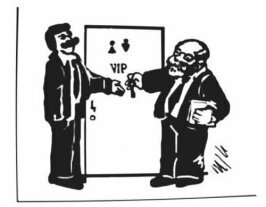 The elite of the University did not immediately realize that VIP object has already handed over, and quietly was going through a transitional period. But you can not hide such a secret forever, and the secretary began to receive seemingly playful hints. Here even the rector was very surprised with the scale of stakeholders range. And although many Cavaliers of this beautiful Order have already gone to another world, yet existing members turned downright too much... Would not the veterans transmit the keys by inheritance! Though God knows, some may well be able to support such effectively their children in the very start of career – the earlier the sun rises, the higher it rises in the zenith. And very astonished University chef was just forced to commit something like recertification. Only God knows how it was done, but new keys began to appear again at some people and to warm their elite souls. Bypassed individuals felt discomfort, suffered and hoped. Particularly was affected one proud veteran professor. On his trouble this veteran almost instantly found out that cherished keys already put into circulation – not for nothing he was a scientist. He began to go often to the University administration for various trifles – the secretary smiled politely, but nothing was handed him. The Professor tried to speak kindly with rector during every chance encounter, but the chef , like, did not understand his bright hope. Once he even tried to use the old key: if it could open? It was an ordeal. And being filled with a consciousness of his objective significance, he decided to act directly and officially. Write a statement to the rector! This will be a document that the chef will have to respond. And to refuse to such deserved man he, of course, will not be able. Professor took a sheet of fine paper and customarily inscribed the title of the document. A harsh phrase throbbed in his head: "Please stop bullying! ", but after a pause he cooled down and wrote: "I request permission to access in..." Here big stopping happened. Fact it is impossible to write "in your closet" as well as "in the rector's toilet" – some nonsense turns. And then there's his home office looked spouse, Professor suddenly felt uncomfortable somehow – upset his wife such a big nuisance at work, of course, not worth it. Even for a moment he wanted to break the sheet but, having remembered the full depth of resentment, focused on his almost ultimate message. And perfected erudition did not fail; he famously concluded the main sentence: "... in the special toilet room." That's it! Next was easier – it was necessary to justify the request, what simply meant to describe own merits, which gray-haired professor knew firmly. The experienced veteran understood that the list must be completed something particularly significant, socially important, he hesitated, thought and wrote: "A member of the Communist Party since such a year." He signed, joined sheets by clip and, gently putting the document in old-fashioned leather briefcase, went not very firm, but proud veteran gait to boldly fight for his reviled rights. And just at this time the rector of the University asked his secretary, if she did not forget to give the key professor emeritus.